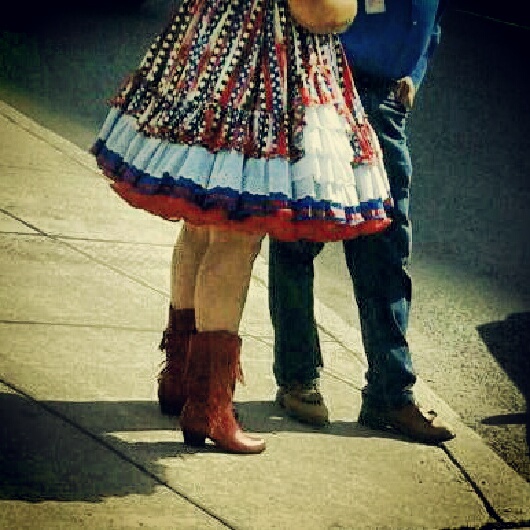 Friday afternoon, my friend and co-worker sporter infiltrated the 61st annual National Square Dancing Convention. Walking back from downtown Bermtopia's indie book store, and seeing all those big skirts and equally big hair, we looked at each other and, despite our lack of square dancing badges, official lanyards, matching I *heart* square dancing T-shirts and knowledge of the secret square dancing hand shake, we were drawn to the convention like lemmings to the sea. "Let's DO this," we said. sporter and I both come from a long line of families who have perfected the crash-a-party-look: Walk in, walk fast. Head up, look probing, intense, but distant. Eyes above the crowd. As if you are On A Mission. I should mention that in this world of patch-work-patterned dancing skirts, crinoline, organza and Sensible Shoes and cowboy boots, sporter and I ... stoood out...maaaybe just a.... titch: Me in jeans and sporter in golf shorts. And both wearing sneakers. And so we strode purposefully through the convention center, past booths promoting square dancing calling clinics and cowboy belt buckles the size of hot tubs, taking in the 5,500 colorful participants and their world of square dance. And that's when we were busted. As we started to enter the room, a convention worker wearing a very impressive, and very official-looking day-glo orange vest, asked, "Have your badges, ladies?" "Um, no. We're just looking for someone," sporter said. We scanned the room looking sincerely urgent in our quest to find the mythical Someone. "Do you see them?" I asked sporter. "No," sporter replied. The convention worker wearing the very impressive, and very official-looking day-glo orange vested, did a mental eyeball-roll. I wonder how many times she's heard THAT line? And with that, we slipped back into the crowd, exited out the first door we could find and went back to work. Our conclusion after visiting the 61st annual National Square Dance Convention: By nature, square dancers are a serious lot. We did not see a lot of smiles in the convention center. Perhaps it's because these folks need verbal instructions when they dance. Postscript: Before I incur the wrath of World Square Dancing, let me just say there's one more post in all this -- one where the square dancers are much happier. "They need verbal instructions when they dance" oh lady! I'd hate to get on the wrong side of you. You know what happened to the lemmings and you still leapt in. What can I say?